Remember, it’s NOT a platform; it’s your own cockpit to drive growth. Bestosys is designed with a single objective – help you to GROW your practice. That’s the very grain of bestosys. You can try some of the growth features within the FREE trial period itself, and taste the positive results! 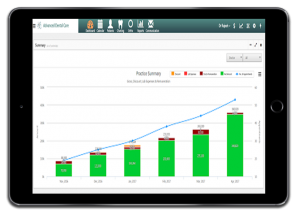 Bestosys Practice Growth dashboard gives you instant intuitive insights into what areas you should work on for higher return on your time. Just look at your practice growth from several different angles and draw an action plan for growth. Retaining an existing patient is much easier and cheaper compared to acquiring new patients. Bestosys patient tracker helps you track and retain your patients effectively. It also helps you maximize revenues on your doctors’ time. Bestosys also strengthens your bonding with patients with several tools, so your personal touch remains intact even as your patient-base grows. To start with, all SMS to your patients are sent with your own sender ID, e.g., DM-DrJain (and not DM-Bestos). This creates an exclusive identity in patient’s mind. Further, personalization, social notes, post-care messages, automatic Indian-language instructions in prescriptions nurture positive experience for patients. Bestosys comes with powerful Social Media Integration which lets you use the reach of social media to spread the positive word-of-mouth. This not only helps you to get new patients but also helps you to engage and retain existing ones.